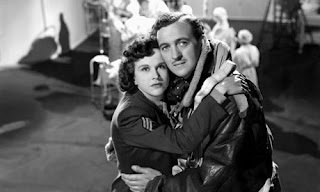 Peter Carter (David Niven), a doomed wartime pilot in a flaming airplane spirals to his death and participates in a final conversation with June (Kim Hunter), a honey-voiced dispatcher. As their conversation over the radio waves proceeds, these two souls remain stoic in the face of certain doom, even as they realize what a match made in Heaven they might have been had things been different. He is touched by her spark of life and compassion, and she for his gentle bravery. But as the conversation over the radio waves proceeds and death for Peter is more inevitable than ever before, the time comes for this couple to say their final goodbyes. It does, and then some, for “A Matter of Life and Death”, a picture rendered by the immortal Michael Powell and Emeric Pressburger – a team of filmmakers who, under the corporate moniker of The Archers, hit bull’s-eye after bull’s-eye. Almost every one of their movies (“Black Narcissus” “The Life and Death of Colonel Blimp”, “The Red Shoes”, etc.) pushes the boundaries of traditional cinematic storytelling with the kind of ingenuity that has seldom been matched (but is certainly emulated and outright copied). From a storytelling standpoint, “A Matter of Life and Death” constantly keeps our eyeballs glued to the screen. One moment, we are plunged into a situation wherein we have absolutely no idea where the story can go and the next, we are convinced it’s going one way and our expectations are pleasantly dashed. This happens so often, that when we are actually treated to a moment in the story that we’re convinced is going to go in a particular direction and it actually DOES go there, we’re delighted that it goes into a comfortable, familiar place – not only because it is emotionally the right thing for the movie to do at that point, but because it gives us WHAT we crave at just the right moment. Unfortunately, the original and rather unimaginative American title, “Stairway To Heaven” was enough of a silly tip-off to let us know that the story would occasionally veer into the spiritual/fantastical realm, but even within that context, Powell and Pressburger’s command of the proceedings is so taut that we’re still on the edge of our seats wondering where this could possibly go. In addition to the magnificent plotting, elegant dialogue and complex characters, “A Matter of Life and Death” is also replete with the Powell and Pressburger visual genius. Not only are images used in thrilling and engaging ways to propel the story forward, but some of the most staggering images and special effects are designed in order to tell the story as well as it is. With a combination of outstanding production design and both optical and compositional genius, this is a picture that not only holds up in a modern context in terms of the effects but also renders many contemporary digital effects to utter shame in comparison. Innovation AND heart. It’s an unbeatable combination. There's a short but fascinating book by Diane B. Friedman,'A Matter Of Life And Death:The Brain Revealed By The Mind Of Michael Powell', that, by the medical procedures of the day,shows how (spoiler)it really all took place in Peter Carter's head. It could actually be a case study, Powell used an incredible amount of neurological detail. I loved the lengths Powell/Pressburger would go to research the worlds of their characters and use reality as an inspiration and springboard for fantasy of the highest level.